I see that BMW is the first team to admit that they will be evaluating Ferrari's "hole in the nose" innovation on their own cars. If they decide it gives appreciable benefits, no doubt it will not be long before the BMWs appear with such a tweak. BMW made a slight stir this year with the advanced aerodynamic ideas on their car - the hole would be one more complication in an already complex design. The F1.08 fairly bristles with winglets, bargeboards, flip-ups and horns, especially at the front. And that makes a nonsense of my support for the team, based initially on aesthetic preferences as it was. I have mentioned before that I am easily persuaded to like a team because they produce a good-looking car; and BMW's F1.07 was exactly that, clean, straightforward, compact and supplied with a livery that allowed its lines to be seen. So one might expect that my sympathies would have changed, now that the BMWs have become so cluttered with extrusions and add-ons that it hardly makes sense to speak of "lines" anymore. And yet I still like them. The reason is that I have come to see what an efficient and unpretentious bunch they are. From the sensible Dr Mario to the designers, engineers and drivers, they keep a realistic view of their own potential, never bragging and always pressing forward to their goal. Somehow I am able to separate the team from the corporate monolith that stands behind it, rarely connecting their little F1 works of art with the desirable but slightly stuffy products of the company. That may be because the company interferes even less with their motorsport division than does Renault (which is a model of how a manufacturer should let its racing team get on with it). Even the fact that there is no intent to cut the "Sauber" from the F1 team's name shows how true this is. It is almost cosy that this salute to the past should be retained and it reminds me of what a quirky company BMW is in its own history. These days it may appear as a typical German giant of efficiency and muscle but it was not always so. Car manufacture for BMW began with a licensed version of the Austin 7 in 1928. This was a tiny family runabout that gave no hint of the sporty machines that were to follow but it gave the company a foothold in the market. By 1936, BMW were producing their excellent sportscar, the 328, a design that was to survive well into the 1950s. That gives the hint as to where BMW went wrong in the mid-twentieth century; they persisted with successful but aging designs and, by the time the sixties dawned, they were in deep financial trouble. It was the 1500 that saved them, a bread-and-butter family saloon with elegant looks and forward-thinking design. On that base, BMW began to construct a range of similar cars that became the foundation for their present prosperity. Running through this roller coaster history is a thread of motor sport and it is this that makes the company different from other German manufacturers. Mercedes, VW and Audi may try their hand occasionally for marketing purposes, but BMW have always been present and do it because they love racing. It is really no wonder that they allow Dr Theissen such a free hand in the running of the F1 team. I like that. We talk glibly of manufacturer teams as though they were all monoliths run by a faceless board of directors at headquarters and yet some are so independent that the parent company is little more than a sponsor. Toyota have shown just how poor a team can be when overseen by the board; BMW and Renault demonstrate the right way to tackle F1. The small team still rules, even though it may now have to wear a company logo. 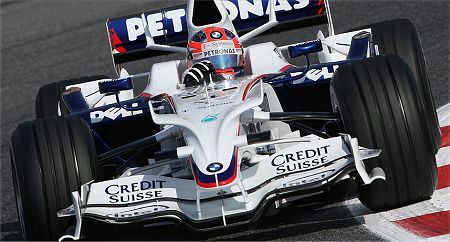 And BMW Sauber, as they prefer to be called, will win at least one race this year, mark my words. I have actually be fond of teams like Sauber and Jordon over the years because they give the young, hungry driver a forum to showcase their talents. I fear BMW may change that as they inch closer to the front. That is understandable and ok as long as another team comes along to help develop new talent. Force India comes to mind at the present time. I agree with you on good looking cars Clive. My favorite is the beautiful green Seven-up sponsored Jordan from the early 90's. What a stunning car that machine was!! you educate me. i likes. Indeed Clive. I just looked at a photo of the Jordan and I think part of the beauty is how clean it looks without barge boards, horns, flip ups and extra aero devices of today. Slick tires and a wide track finish the classic look of that car. I'm actually looking forward to next year's aero rules and slick tires coming back. It just may make the cars look better! I think that although the current BMW has all sorts of complicated aero parts it still looks Ok while some of its contemporaries look horrific. I don't know if that is because of the colour scheme or the shape of the car but something about it looks right. The 1991 Jordan is the best looking car since the Lotus 79. It is quite amazing how we can all remember the sponsors who were involved with attractive cars. Maybe there is a hint in there for someone at the top of F1. Make the cars attractive and the sponsors will spend because they will be remembered in decades. Iam surprised they are hanging on to the Sauber name as I thought the whole point of BMW buying a team was to show that they could do the job better on their own than by an association with a traditional racing team. I know Peter Sauber is still involved in some capacity in the management of the team but does he still have a shareholding? I assume in time they will either drop the Sauber name or build it and use it as a brand on their high end road cars. Sort of M Sport +. I have been a fan of BMW-Sauber since their entry for a reason you just gave in this post. They are not pretentious, are low key, and don't brag or get into a war of words with anyone. This is what I have come to know of this German Company that is reflected in the F1 team. My wife and I own 2 bimmers, are shopping now to trade one in, and our dealings with BMW are just the same as we see with the F1 team. They get on with business, produce good cars and that's that. Keeping the Sauber name is as you say a reflection of the team and show appreciation of their roots. My wife also works for a German company and the same goes for them as well. As far as the looks of the car, I like it. The bits here and there on the car are working for them and in the end, that's what counts. Efficiency also works with BMW-Sauber. They keep the business of F1 clean and controllable. I believe Peter Sauber still owns 20% of BMW-Sauber, however he said in an interview with F1 Racing (August 2005 edition) that he didn't make any requests as regards to the team name. I think the Sauber name is being retained to respect the culture of the Hinwil staff, who still compose the majority of the team members. It's a symbolic gesture that's good for team morale.